Following the Olympics from the US has been a little strange. We’ve caught some of it live, some the following morning when we wake up and some just by following headlines, Facebook messages or Twitter feeds. The children have been watching it with me and were particularly keen to catch Imogen Cairns from their Gymnastics Academy at home. Being such a distance away we thought it was really important to make an effort to support our home team. 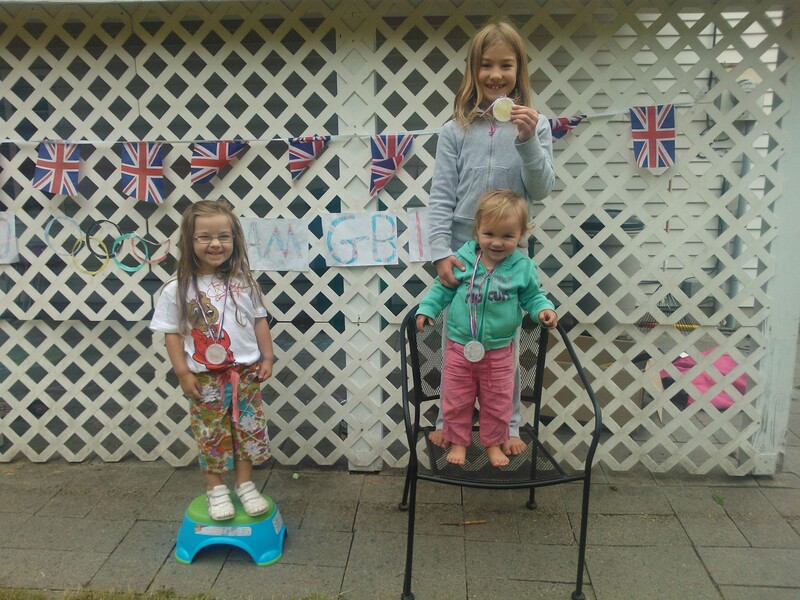 We hung our Union Jack Bunting in the garden and the girls made Olympic rings, copying the colours carefully and a sign supporting our team. We then talked about staging our own neighbourhood Olympics, Team GB competing against Team USA. My 8 year old made a list of all the events we could include. I ordered a pack of blank medals that the girls could colour and decorate and the girls spent a morning completing them. 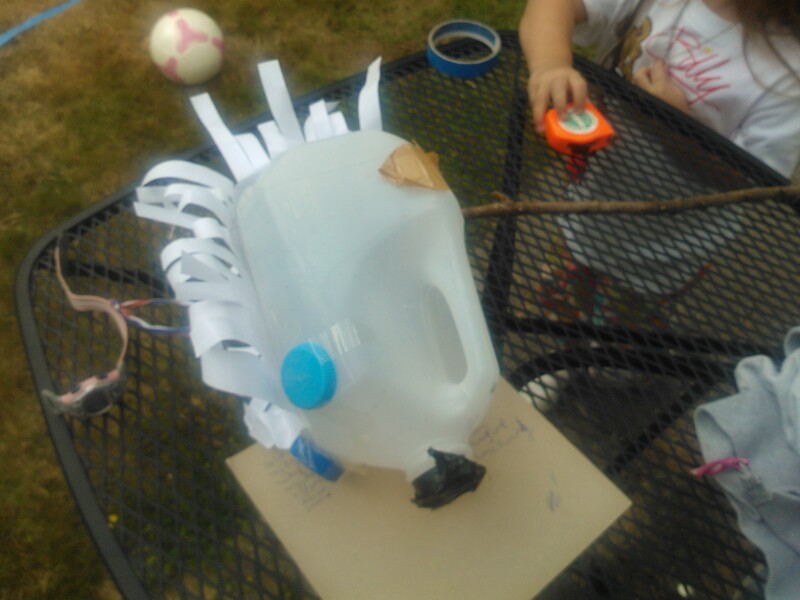 We made a hobby horse for the equestrian events using a stick from the garden and an empty milk carton. We then set to work marking out a track using masking tape. A number of low level obstacles were found to act as fences for the show jumping and double up as hurdles. We also found a straight stick to use as a javelin, a frisbee for discuss and a tape measure and stop watch for accurate results. Jumping boxes with a hobby horse was quite difficult, my one year old preferred to drag the horse by her side but my 3 year old had a great time. It didn’t matter to her that she didn’t win gold, she was very excited to stand on the podium (her bathroom stool) and receive her silver medal. We sang the National Anthem and this has been a really good way for them to learn the words (perhaps I’ll leave the Welsh one until they are a little older). This was my one year olds favourite event she stepped her way over all the obstacles and loved waiting for the Ready, Steady, Go. Event 3 – Long Jump. 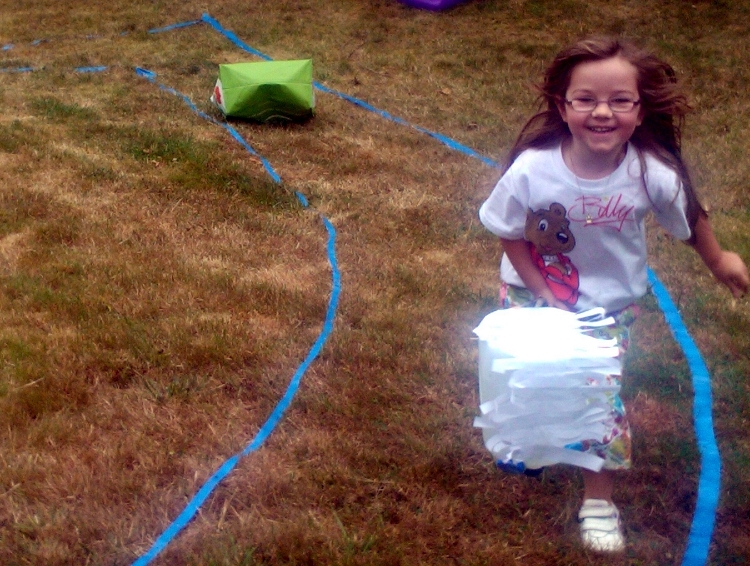 We marked a place on the lawn where the children would begin their run up and another where they would begin their jump. I explained that if their foot went over the line then the jump wouldn’t count and they managed to remain accurate every time. The girls helped me to measure the jumps. My 8 year old fell over every time she jumped so there was a little bit of dispute over where we should measure her landing. I explained that the Olympic jumpers fall over because they jump such a long way and land in sand. 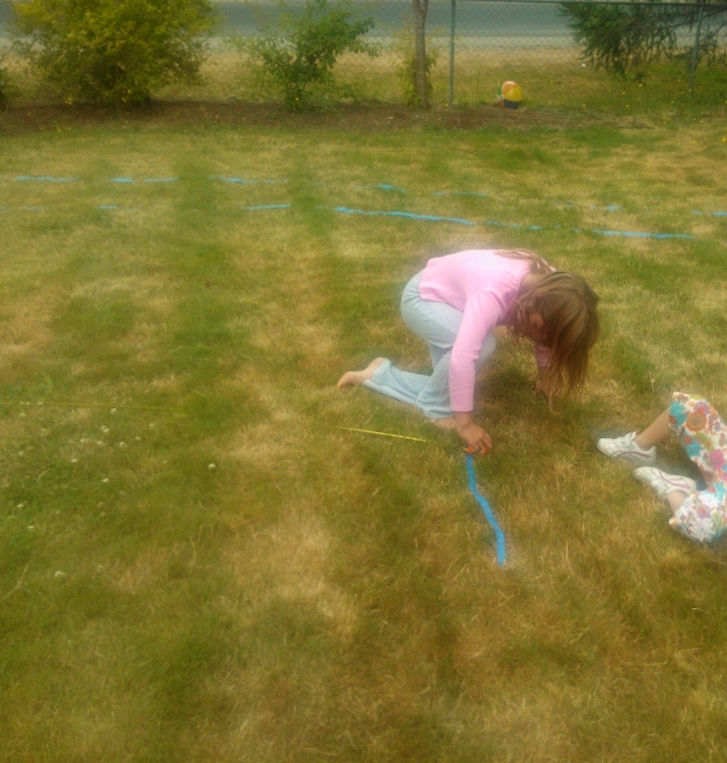 I showed the girls on the tape measure how far an Olympic long jumper would travel and they were amazed. The girls found it quite difficult to throw the javelin from their shoulder but managed a few good throws. I showed them the technique I had been taught at school and my 3 year old who is still deciding whether she is left or right handed needed to work out which was her stronger arm. To add a bit of variety I showed them how to spin around and then throw the frisbee. It took quite a lot of practice as it kept landing at their feet or travelling in the wrong direction, which my 3 year old found hilarious. Eventually both girls managed good throws, longer than the tape measure, so my 8 year old had to employ her adding skills. My 3 year old was very proud to win Gold beating her sister by 1 inch. Events 6 and 7 – Sprint and Long Distance Run. 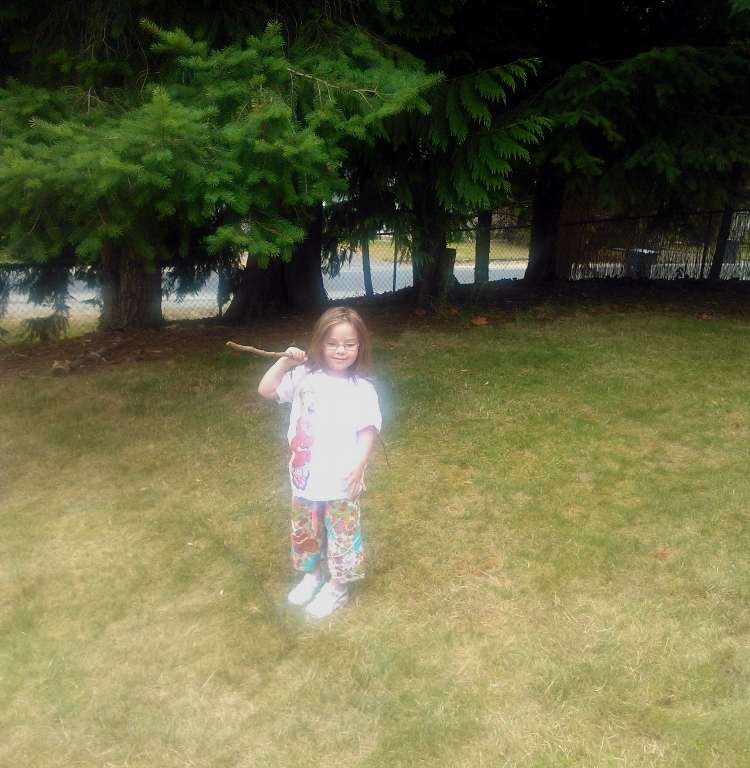 To make it fair we gave my 3 year old a head start and during the long distance run my 8 year old ran an extra lap. After winning comfortably she asked if she could race me – I finally won my own Gold Medal. Our Track and Field Day is over. Other events the girls want to stage over the next few days are football, tennis, volleyball, basketball, table tennis, gymnastics, boxing, and cycling. We completed our rowing and swimming at the weekend at the lake but the younger ones might enjoy making a cardboard box boat to row. We’ve had great fun and hopefully some of the neighbours will be able to join us tomorrow to get some real competition going. Thanks to Vicki for the show jumping idea. Previous PostButlins – A Great British Family HolidayNext PostDo Children Need Toys?